Nothing like the early morning hours for a little peace and quiet to write a post about this mouthwatering and wonderfully comforting food: The Fresh Ravioli. Before everyone is up, before the phone starts ringing and before I am back to the task list for my cookbook, I thought to sneak in this recipe, which I have been trying to post for a week now! It is an unbelievably busy time for me at the moment! As you may already know I am working on my first cookbook, which explains why I haven’t been writing much else at the moment. So here, I am sharing with you one of my favourite Ravioli Recipes. On days when you have the time, and thinking to hit the kitchen to cook up a treat for your family, then nothing beats making Fresh Ravioli. To me, making fresh pasta is one of the most delightful and rewarding kitchen activities, and I know that once you get into it yourself, you will feel the same. Play some Italian music – get in the mood – sip on wine and make pasta! Enjoy your kitchen and the whole kitchen therapy! Trust me, there is nothing like it! Then, to top it all up, dish out a bowl of Ravioli for your family to enjoy and … feel the love! If your time permits, make the ravioli and finish the dish on the same day. When pressed for time go in stages as I have done here. Day 1: Make the ravioli. Follow the steps in this recipe below. Day 2: Cook the Ravioli in a cream and tomato sauce. Follow the recipe on this link. Otherwise you can always make the Ravioli on those “Me time” days and freeze it ready to use anytime. This Ravioli freezes well for up to 3 months! What is not to love about this! Make the pasta following the instructions on this link. Then leave the pasta to rest. In the meantime, make the spinach and ricotta filling: Wash the spinach leaves, then gently squeeze out any excess liquid. Place the leaves on a kitchen towel and pat to dry. Roughly chop the spinach. In a large bowl, stir the Ricotta cheese until it loosens up. Add the chopped spinach and grated Parmesan and mix all well. Add the egg and mix well to combine. Cover with cling film and refrigerate until ready to use. Once your pasta dough had rested, start rolling it to aerate (as explained in the making of fresh pasta post on this link). Once you have finished the rolling and have achieved long and very thin sheets of pasta dough, cut these sheets into squares, using a square cutter for a more traditional look, or you can go for a round cutter for a different look. You can cut the sheets with a rolling blade or a knife, but using a cutter guarantees uniformly sized raviolis. Keep the dough covered with a 100% cotton cloth, when not using to prevent drying. Working with small batches at a time, place the pasta squares, separated, on a clean work surface. Scoop out 1 tsp of filling and roll it into a ball, then place at the centre of the pasta square. Make sure the filling does not touch the edges of the pasta square. Using a small pastry brush – dipped in water then tapped on a kitchen towel – slightly dampen the edges of the pasta square around the filling. Carefully, cover with another pasta square, without squeezing in the filling. Start with sealing one corner, then move on to seal the whole square, where the filling is encased, and none of it is out or touching the sides…etc (if the filling touches the sides, the pasts will open up during cooking). pinch all the edges to ensure they are sealed. Using a small fork, gently press along the edge to give it that famous Ravioli look and to seal it even more. This is optional, as you can simply keep the pasta as is, without pressing or you can roll a pasta rolling blade around the edges as in the picture above. Place the shaped raviolis on a tray sprinkled with flour. Repeat until you have finished the whole quantity. Once done your raviolis are ready for cooking. Follow this link for the Ravioli cooked in cream and tomato sauce. Otherwise they are ready for slightly drying then freezing. 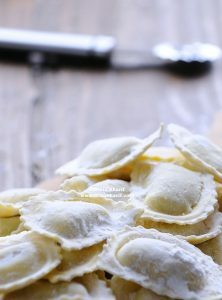 To freeze the ravioli: Sprinkle the finished raviolis with flour and set aside to dry until the evening. Then stack in a freezer safe container separated with baking paper. Seal and freeze for up to 3 months.